Gardai are asking people who own bicycles to record the frame or serial number of their bicycles in identify the bike in case of theft. Often when stolen bicycles are recovered by the Gardai, it can be next to imposable for the owners to be identified — and owners not recording the the serial number does not help matters. As we have reported before, Gardai estimate around 35% of stolen bicycles are recovered, but only between 5% to 10% of the recovered bicycles are reunited with their owners. The frame number on a bicycle is most often located on the bicycle frame, under the peddle crank (other locations are listed on the blue image below). If your bicycle has been stolen and you have not recorded the number, it’s worth trying to contact the shop where you bought the bike, as some shops keep records of the numbers. 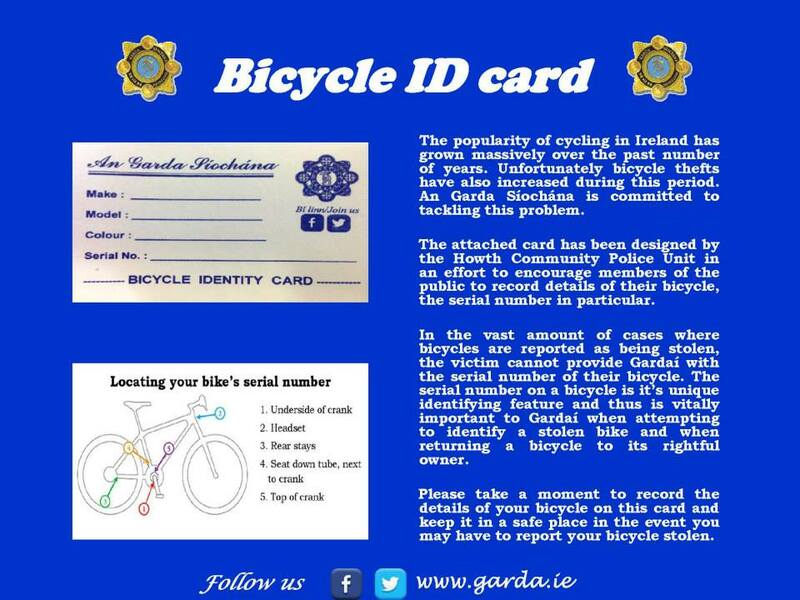 “This morning as part of the initiative Garda Lisa Martin and Garda Colm Tracey, Clontarf Garda Station distributed bicycle ID cards with explanatory leaflets to cyclists at a checkpoint on the Howth to Dun Laoghaire cycleway at Clontarf,” said the Garda Facebook account. However, there’s no indication that the force will ever roll out a national bicycle database. For the last few years, a limited bicycle database has been run at the Bridewell and Donnybrook Garda Stations, but these are local initiatives aimed at residents and workers in the surrounding areas. PARK(ing) Day is a annual open-source global event where citizens, artists and activists collaborate to temporarily transform metered parking spaces into “PARK(ing)” spaces. It’s on September 19th, and the Dublin Cycling Campaign will have their annual space in Molesworth Street. We hop to have a Garda along who will take these details from all passing cyclists. We’ll also have Dr. Velo, a qualified bicycle mechanic, who will do a “health check” on all bkes brought to the space. See you all on the 19th. I had two bicycles stolen in Dublin, total cost €1,500.00. One was 2 weeks old and taken from UCD (Double locked), the other taken from an underground Bicycle shed off Lr Grand Canal Street. Reported both to An Garda Siochána, including frame numbers etc., and I never hear another word from them to this day. I have no confidence that this will make the slightest difference, unless it’s a Garda bicycle that gets stolen. At Cyclesure.ie bicycle insurance, not only can you get get your bike insured against theft, but you can avail of a bicycle register/marking kit to help prevent theft and to trace your stolen bike should it be stolen and recovered. it has worked very well since we introduced it in 2009 and uses labels with a unique registration number for each bike, is applied with UV ink for an permanent invisible mark with free phone number, and Gardai can access the database, the International Security register to trace owners of recovered bikes. Registering your bike is important, but marking it also increases the chances of getting it back again. You can also now buy the kits at a special bike week discount of €15 for lifetime marking and registration. Just enter the code “bikeweek” when purchasing at facebook.com/Cycleregister. You can use the same code to get 10% off our bicycle insurance at http://www.cyclesure.ie. It is absolutely astonishing there isn’t a national database, and no plan to roll one out. This is the obvious way to combat bicycle theft. Give the public the opportunity to register bicycles at the local police station, and allow cops to quickly and easily check suspect bicycles against this database. It would severely impact professional bicycle thieves. I bought a second hand bicycle last week, and I want to register it, and check if it is stolen. Apparently I can’t do that.